This article is about the tower in Coldharbour. For the book, see The Lightless Oubliette (book). Coldharbour is a series of prisons within prisons. The Lightless Oubliette was specifically built to hold entities who can manipulate light to magical ends. The wardens of the Oubliette are careful to use only lights of the colder spectra, as these are less susceptible to refocusing. The rules that govern the behavior of Molag Bal's servants are known as the Seven-Hundred-and-One Edicts; special cases are covered in the Mandatory Codicils. Violation of even the least of the Edicts can result in a sentence to the Scathe-Rings. 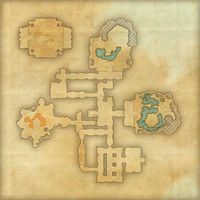 The Lightless Oubliette is a Daedric ruin in western Coldharbour. 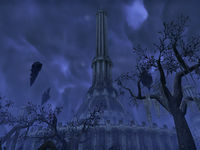 The architecture is an imitation of the ancient Elven style, and the ruin itself appears to be a replica of the White-Gold Tower, at least on the outside. It was designed with the sole purpose of imprisoning servants of Meridia. The Lightless Oubliette Objective: Rescue the Last Ayleid King from the Lightless Oubliette.